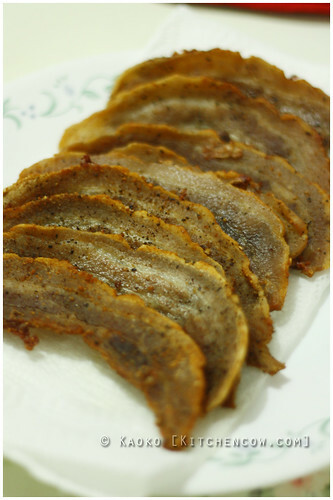 So, there I was, staring at a pack of thinly sliced pork belly, dreaming about bacon, chicharon, lechon kawali and Hana’s pork senbei. It’s enough to get a girl in the mood to experiment. The pork belly was actually for samgyupsal, but I was hungry and we didn’t have lettuce or other samgyupsal fixings in the house so I figured I could use it for something else. 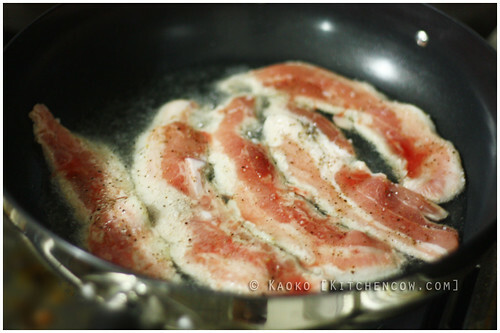 As mentioned, I was dreaming about bacon and pork senbei. Plus, you can’t go wrong with frying pork, right? It’s simple enough. Lay the pork strips on a board. Dust liberally with rock salt and freshly cracked black pepper. Fry. Listen to the sputter of the fat as the pork makes contact. See the meat brown gently, until it darkens to a crackling crisp. Flip to repeat the process. Drain on paper towels and try not to drool. Serve with a mix of soy sauce and vinegar. And rice. Loads of it. Crunch, crunch, crunch. Aren’t simple experiments wonderful? 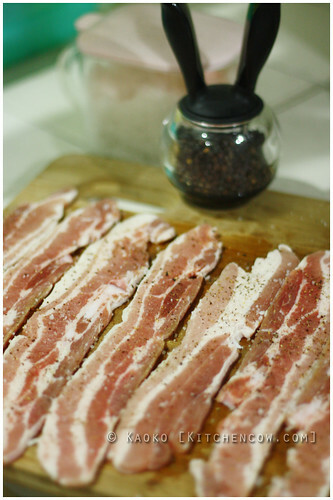 I am so trying this soon…I love buying this type of “bacon cut” pork belly but I usually do a Korean pork preparation with it. This simple, straightforward prep looks delicious though! Hello! I referred you to GMA News Online. They asked me about Bento and told them you were my Philippine Bento inspiration. LOL! They linked back to your blog. Hehe! Aaaah, now I’m really, really, tempted to try this out! 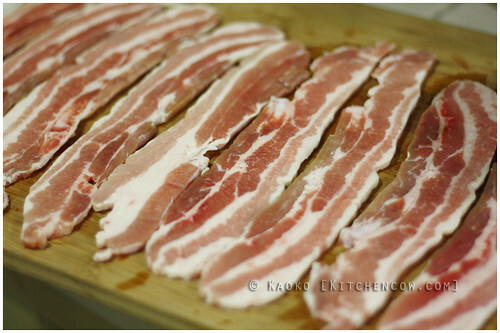 Just woke up and I’ve got some bacon in the freezer… YUM!